We, along with our colleagues across the country in the American Booksellers Associations, have sought for years to find the right e-book solution for our discerning customers. This week, it just got easier. If you have a mobile browser, tablet, PC, Mac, or smartphone you use for e-reading (that is, reading e-books and magazines, etc. ), you can now buy from us. Just set up your new Kobo account at Destinations Booksellers and all your purchases will accrue to your local independent bookstore. Kobo is the world’s most popular e-book source because of its open nature. Reading with Kobo is not device-dependent, so once you buy an e-book, you own it and can read it on any and all devices once you download the application and set up an account with Destinations Booksellers. If you don’t already have a dedicated e-reading device, we have 2 elegant solutions that you’ll love. 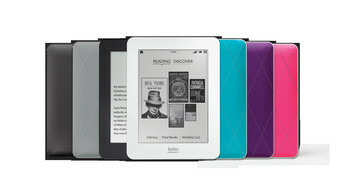 The brand-new Kobo Mini is on sale this Friday and Saturday for just $49. To read more about this, click on the graphic above or visit www.destinationsbooksellers.com. So, if you’re already reading on a tablet or smartphone, visit our Website and switch your buying to us. And if you need a dedicated e-reader for yourself or as a gift, there could be no better time than this weekend, Friday and Saturday, Nov. 23-24, to pick one up. I’ll be giving demonstrations at 10 and 11 a.m. and again at 4 and 5 p.m. on Saturday.